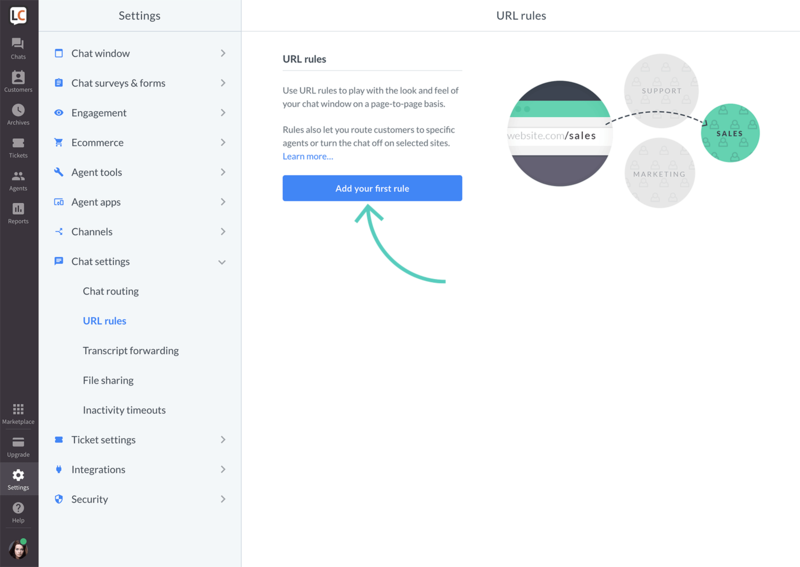 URL rules let you route chats from selected pages to specific groups of agents. For example, you may have dedicated agents skilled in different areas, like sales and support. With URL rules you can route chats to one group or the other depending on the page where the chat started. Using URL rules, you can also play with the look and feel of your chat window on a page-to-page basis. You can even set a rule that will turn the chat off on selected pages. Route chats to a specific group of agents. Customize chat widget on different websites. Disable LiveChat on selected pages. Log in to LiveChat and go to Settings → Chat settings → URL rules and click on Add your first rule. Enter the URL address of the page you want to route chats from. This can be either a partial or an exact match. Use contains to match a part of a page address. For example, you can cover all product pages creating just one rule for all pages. The is exactly option means that the entire page address must match. It’s useful when you want to use the rule for a specific page. Next, choose the group that will answer chats coming from those pages. To finish, click on Add rule. From now, all chats started on the specified page will be routed to agents from the selected group. You can use URL rules and groups to change how your chat widget looks and behaves on different pages. For example, if you have an English and a French version of your site, you can display your chat widget in a language that matches the page’s language. If you want to change the chat window to French for a particular page, start by creating a group for agents who know that language. Learn more about groups. Once you have the group set, assign the URL address of your French site to the group of French-speaking agents. Next, go to Settings → Chat window → Language and select the French group using the Setup for group option. Customization—change the look and feel of the chat widget on both desktop and mobile versions of your site. Language—set the language and personalize chat widget messages. Pre-chat survey—edit pre-chat survey settings. Post-chat survey—change post-chat survey settings. Queued visitor—personalize queued visitor message. Ticket form—edit ticket form settings. Eye-catcher—choose from a gallery or add your own eye-catcher. Chat buttons—add a chat button to your site. Canned responses—add and edit canned responses. Email—forward your support e-mail to LiveChat. Email notifications—set automated emails to visitors. You can turn off the chat widget on selected pages by using the URL rules. It’s useful if you get too many unproductive chats from certain pages, like your main page, and you want to keep your LiveChat only on pages that generate better leads, such as your product pages. Specify the page address (or a part of the address) you want to disable LiveChat on. That’s it. The chat widget will now be disabled on the specified page.